Biriyani (பிரியாணி) is essentially a meat based mixed rice preparation. According to one school of thought, ‘meat rice’ (ஊண் சோறு) of the native Tamils is the forerunner of biriyani. Though the origin of biriyani is thought to be Central Asia, it has become very popular in South Asia and also gaining popularity internationally. In India, there are many varieties of biriyani based on the type of meat, egg or seafood used for making it. 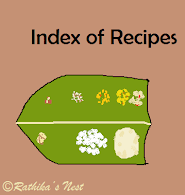 There are also regional variations depending on the use of condiments and the type of rice used. In recent times, a few traditionally popular regional biriyani varieties are sold in food chains across South India. Vegetable biriyani (காய்கறி பிரியாணி) is the poor cousin of the conventional meat biriyani. Nonetheless, it is popular among vegetarian diners. Of the many methods of making vegetable biriyani, this comparatively easy recipe works great for me. Give it a try. *Potato, carrots, French beans and green peas may be used. Shell the peas. Wash the vegetables and peel potatoes. Cut the vegetables into 1” long pieces. Method: Grind ginger and garlic into a fine paste. Finely powder cardamom seeds and mace together and keep aside. Heat oil in a handi or pressure pan, add clove, cinnamon, bay leaves and star aneez and sauté for a minute. Add chopped onions and fry till they start to brown. Add chopped tomatoes and ginger garlic paste. Mix well. Cover and cook on low flame till tomatoes become pulpy. Add cut vegetables and sauté for a minute. Beat the curds well, and add turmeric powder, red chilli powder and garam masala powder. Mix well. Add the curd mixture and required salt to the vegetables. Cover and cook on low heat till oil separates. Wash the rice well, drain and add to the handi. Mix 2 teacups (400ml) of water to milk, add this mixture and salt to the rice. Mix well. Cover and pressure cook for 5 minutes (6 whistles). Switch off the fire. Once the pressure subsides, open the lid and mix the biriyani gently with a fork. Garnish with coriander leaves and grated ginger. Serve hot with onion raitha/ pachadi. Click here to find out how to make onion pachadi.